Just stumbled across this today (hope I'm not late to the party on this ). Many folks have speculated that PDMT would have been better with practical suits, and the same designs refined to be less cluttered and skinnier. I think this is what you'd get. Splinter is a huge improvement, while the rest...er....well? Last edited by Commenter 42; 08-02-2015 at 12:51 PM. They kinda have a Mac and Me thing happening in the eyes. These are probably the closet thing we'll get to real ninja turtles. My only complaint would be the lack of any real muscle definition. Still...a thousand times better than Bay turtles. It's funny, so much effort went into the detail on the head and shell, but then the arms, hands and feet, the scales, a total rush job. Not to harp on it, but this is exactly why I'm for Sliders over Box turtles. Yep, but I've seen worse. We live in an age of the hyper grotesque. I've yet to see live action, realistic designs that don't trip people the **** out. I can appreciate the work that went into these but I'm not digging the faces, lack of muscle tone, and scales. What I do like is that they actually look young and teenagerish. I saw these a while back and they're a really cool project. Not my definitive versions by any stretch, but much more appealing than the BayTurtles designs, and I like the level of work put into the heads/faces. Like others said - I'd tone down the scaliness a bit and have some more work put into the muscle definition. But these are definitely on the right track! I personally would use much less of scaley skin on them and avoid using these pointy fingernails or claws almost...I know both these things may come with some turtles, but I myself don't like them too much in ninja turtles design..
anyway, didn't want to come off as critisizing this project so much, I actually find this take on them refreshing and much better than the bay turtles, even if I would have gone for a different route myself..
Slightly better than BayTurtles, in that it sticks to the basic idea of how Ninja Turtles should look(body type and accessories), but far too realistic and still just unpleasant to look at. Splinter is a billion times better though. I'd tone down the scaliness a bit and have some more work put into the muscle definition. But these are definitely on the right track! Nailed it. For this particular style, those are my only complaints with 'em. They're perfect otherwise, & I'd be more than happy to get a film with this design. Are they scary? I think they're actually pretty cute. If they weren't so dang scrawny they'd be perfect, imo. They make me nervous. Red eared sliders or semi aquatic turtle, the TMNT species, are not that scaly. That scaly skin is from tortoises, which they aren't. Master Splinter is OK.
Last edited by Klunk1234; 08-03-2015 at 07:36 AM. With some tweaks, something like this would work so well with the Suit+CGI concept Peter Laird was talking up years ago. You'd get the advantage of smooth animation where you need it and avoid the uncanny-valley-ness of pure CGI creations against live-action everything else. I like the skinniness, personally! They're teenagers, so you don't want them to be too big. And the jacked-up look isn't a good fit for ninjas, IMO. Take something like this and give them a Bruce Lee-esque physique and you're golden. Agree on Splinter; would like to see some better shots of it, but from that little bit...way better than freaky rat-with-mange 2014 Splinter. Also looks a lot more kindly. The Turtles... well... not my preferred flavor, definitely caters more toward those that long for a more animalistic-looking TMNT, but still pretty very well done. Agree scales could have been toned down, like the individual scale bumps are just to big/bold; reminds me of something, but can't place it at the moment. They could totally make a cool looking ninja turtle outfit if they wanted too. They used a costume for Abe Sapien in the Hellboy movies, right? It's proof that it could work for the turtles. I like em, they look trippy. Kinda scrawny and a bit too scaly, but the faces, plastron and overall look is pretty great IMO. Prefer this look over BayTurtles easily. 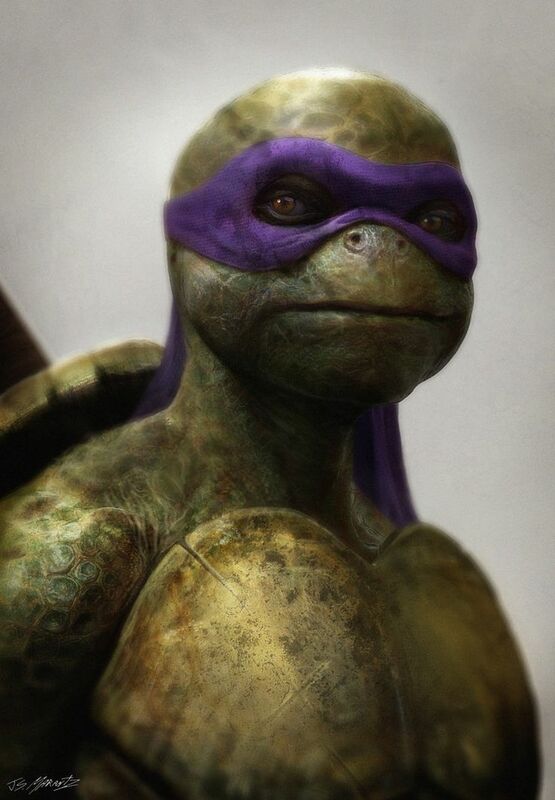 Also Splinter looks boss as well, and also not as scary as the Turtles.